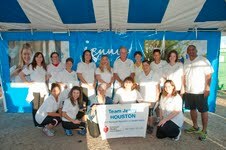 I was invited to join “Team Jenny” at the American Heart Association Heart Walk today at Reliant Park in Houston this past Saturday. I got to walk with Jenny clients Pam King, Pamela Yale and Terry Burchfield, who have gotten heart healthy and changed their lives for the better. 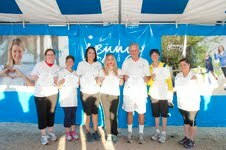 We pounded the pavement (inspiring walkers along the way) for an amazing cause! Pam King knows only too well the importance of heart health. About seven months ago, her 13 year old daughter Anna, was diagnosed with heart failure. This came as shocking news, as the family was not aware that Anna had been living with a rare heart condition known as dilated cardiomyopathy, which means that Anna's heart is diseased and worn out. Now Anna and her family are working with a transplant team at Texas Children’s Hospital in Houston, and waiting for a new heart. Pam decided it was time for her to make a healthy lifestyle change so she can model eating well and reducing risk of heart disease for the entire family, so she joined jenny to get help and support. She is already down 20 lbs. * Pam says that Anna is confident, courageous and ready to win. Pam and her sister are doing the Heart Walk in honor of Anna, who turns 13 on the day of the walk, November 3rd. Before Jenny, Pamela did not exercise, ate foods full of fat, salt, sugar and had little fruits or vegetables in her diet. When the pounds continued to add up, no longer were Pamela’s so called “comfort foods” comforting, instead they were condemning. Pamela’s turning point was when she tried on a watch and the band did not fit over her large wrist. Pamela immediately knew that it was time for a change and she went straight to Jenny Craig for the support and help she needed. She lost 70 lbs. * and says she now makes time for herself, her health, to feel good about herself, and have control over her life. She went back to the store to buy that watch and today it fits perfectly, just like her new healthy lifestyle! Terri always blamed her health and weight issues on her genetics – she was just following in her mother and maternal grandmother’s footsteps. Like both of them she was overweight, and had high blood pressure and high cholesterol. When she topped the scales at over 200 lbs, she resolved to make a change. Terri took the advice of one of her co-workers who was successful at losing weight with Jenny and joined the program. Terri was also successful and lost 95 lbs. * Her new eating habits learned with Jenny are now embedded into her everyday life, and Terri has also become much more active, even completing her first 10K. Terri is proud that the changes she has made have also influenced her family to make healthier choices too. Terri is now much healthier and fit and could not be happier with her results! 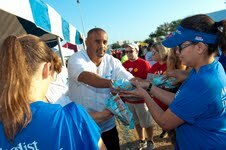 Jenny Craig employees handed out healthy snacks to all the walkers. And the best news of all...I have been keeping a secret but now I can shout it out, loud and proud. I am officially joining Team Jenny Craig. I will be on the plan for an entire month. And will be sharing the whole entire program with you. I am going to be tranparent showing you everything, like I normally do. I am hoping to lose 25 lbs. Terri was very inspirational. She and I finished the walk together. She runs 7 miles on a regular basis. Amazing, after losing over 100 lbs in 1 year and now she is running. Tomorrow I start my consultation. Stay tuned.